This year marks the 50th Anniversary of the MIT Black Student Union. In honor of this significant milestone, BAMIT is excited to host the BAMIT Capstone Weekend on Friday, November 2nd to Sunday, November 4, 2018. Our theme is The Road to 50: The Power of Community. During the weekend we will celebrate the long history of the BSU at MIT, and connect with members of our extended community to both learn from and support one another. We also will recognize the contributions, accomplishments, and sacrifices of past and present MIT alumni, while continuing to plan for future success. Our focus is identifying how we can positively impact communities inside and outside of MIT. We are excited about the opportunity to convene current MIT students and alumni to share stories about the power of community. As we celebrate memories of studying, laughing, living, playing, singing, pledging, innovating, and serving together, we will also hold high our enduring truth: We are a dynamic, diverse, and vibrant community. We have always been, we still are, and we will continue to be. Celia Berry, summer intern at GE Research Center. We are excited to announce the formation of the new BAMIT Community Advancement Program Fund. The BCAP Fund will provide grants to Black students at MIT engaging in outreach projects that impact communities in the Black Diaspora. All donations and charitable contributions collected above the costs associated with the Capstone will help launch the BCAP Fund. Our goal is for the BCAP Fund to empower ambitious students who are committed to addressing the many challenges facing our communities in education, architecture, the arts, STEM, and environment and cultural concerns. After MIT students have been selected for designated BCAP projects, BAMIT will engage Black alumni to serve as mentors and additional sources of support. This program is a new and important BAMIT initiative that will become part of our legacy. It will enable greater community impact and provide a new way to connect alumni to students and to each other. Please consider multi-year support. Contact treasurer@bamit.org for more information or click the link below. We have a full weekend agenda filled with engaging content for everyone! Our program of events promises to be challenging, informative, inspiring, entertaining, and fun. Plus, there will be ample time to connect with friends, both new and old. As of today, this is where we stand but there are still a few surprises to come. Continue to check the website for updates and additions. Orientation for the Day: A review of the activities for the day. Recollections - Connecting the Past to the Present: Discuss the history of the BSU with former and current BSU Co-Chairs and Founders. MIT & Slavery: A presentation by MIT students (Kelvin Green; Charlotte Minsky; Mahi Elango) who conducted research for a new MIT course led by Craig Steven Wilder, Barton L Professor of History; author of Ebony and Ivy: Race, Slavery, and the Troubled History of America’s Universities. BSU Founders Lunch: Meet BAMIT supporters, new and old, and discuss how we can continue to promote our mission. L. Rafael Reif (MIT), the Institute's 17th President, has been a member of the MIT faculty since 1980. He previously served as Provost, head of the Department of Electrical Engineering and Computer Science, director of the Microsystems Technology Laboratories, and was the Fariborz Maseeh Professor of Emerging Technology. Shirley Ann Jackson ’68, PhD ‘73 (Rensselaer) helped to organize a group of African-American students, which ultimately became the Black Students’ Union (BSU). Dr. Jackson is one of the two first Black women to receive an SB degree from MIT, and the first Black woman to receive a PhD in any discipline from MIT. Larry Bacow ‘72 (Harvard) was a member of the MIT faculty for 24 years. He served as MIT Chancellor and Chair of the Faculty, and was the Lee and Geraldine Martin Professor of Environmental Studies. Lightning Talks (simultaneous sessions): Be inspired and energized by the accomplishments of alumni with diverse academic degrees, class membership, and in varied fields. They will give 8 minute talks about their work and how it impacts the “community”. What’s Happening at MIT - Student & Alumni Perspectives: A community building event for BAMIT members and current students from the Black community (undergrad and grad) to freely share with each other. This is a closed session. Reflections: An opportunity to connect with fellow alumni. Capstone Gala: Join us for our formal evening celebration, featuring a catered reception, awards presentation, and a keynote address by Dr. Shirley Ann Jackson ‘68, PhD ‘73, BSU co-founder and the first Black woman to receive a doctorate in any discipline from MIT. During the evening, we will also recognize and salute persons that have been mainstays in the Black Community. The program will be followed by music and dancing. In recognition of the Power of Community and the impact of Wakanda, African Attire is welcome. Community Brunch & Networking: Connect with friends, new and old, for a light brunch. Welcome and Introduction: Joi Ito, Director, MIT Media Lab. Afro-futurism Panel: Looking at examples of movies such as Black Panther, Star Trek, and others, we will explore the impact of the Black experience in science fiction, culture and technology, looking at how each influences the other. By examining examples from the past and present, we will imagine the effects of these relationships on these elements in the future and discuss the implications. This is a bridge to the next 50 years and beyond. Reflections & The Road Ahead: An opportunity to share lessons learned and plan next steps. 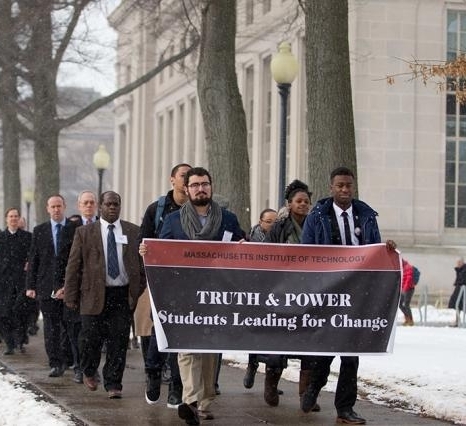 The "Truth & Power: Students Leading for Change" MLK Celebration program began with a silent march starting at Lobby 7 and ending at Walker Memorial Hall, February 2016. Front row, left to right: Alberto Hernández ’17 and Rasheed Auguste ’17. BAMIT Redcoats at the Black Graduate Reception during Tech Reunions, Black Students' Union Lounge, 8 June 2018. Left to right: Shirley Jackson '68, PhD '73; and Ernest Cohen '64. 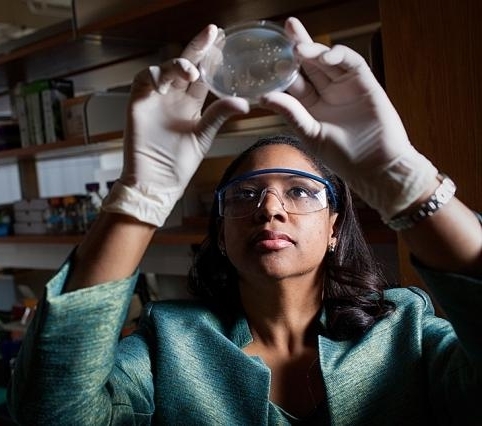 Kristala Jones Prather, shown examining yeast cells in the Prather Lab at MIT, 2013. Kristala Jones Prather '94 is Professor, MacVicar Faculty Fellow, and Graduate Admissions Chair in the Department of Chemical Engineering. Robert L. Satcher, Jr., STS-129 Mission Specialist, 19 August 2009. Robert "Bobby" Lee Satcher, Jr. ’86, PhD ’93 is a physician, chemical engineer, and NASA astronaut. At 38 years old he was one of 11 candidates chosen from a field of more than 4,000 applicants as part of the first new class formed since the Columbia Challenger space shuttle accident in which Ronald E. McNair PhD '76, lost his life. NASA astronaut Yvonne Cagle (center) poses with MIT Black Women's Alliance co-chairs Tiera Guinn '17 (left) and Alyssa Napier '16 during a visit to MIT, 2015. President Barack Obama awards S. James Gates, Jr. '73, PhD '77 the National Medal of Science, 1 February 2013. In 2015, Bronx native Marcus Aurelius Thompson became the first black professor to earn MIT’s highest faculty honor: Institute Professor. He joins a small group of Institute Professors at MIT, now numbering 13, along with 10 Institute Professors Emeriti. Thompson is one of three faculty members to be named Institute Professors since 2008. Chemical engineering professor Paula Hammond works a small-scale experimental fuel cell under tightly controlled conditions, 2007. We’ve secured a block of rooms for Capstone attendees at The Hyatt, Memorial Drive, Cambridge. First come-first served. For more information, visit The Hyatt's website below. The BAMIT Capstone is a great opportunity for MIT alumni and others to make a meaningful contribution to diverse education at MIT. We plan to achieve record levels of participation in both attendance and giving. Our goal is to announce total donations in excess of $250,000 at the Capstone Gala to launch the BAMIT Community Advancement Program and endow the BCAP Fund. We have a range of sponsorship opportunities, from the Capstone Level of $50,000 to the Technology and the Dream Level of $1000. No gift is too small. And, as always, your giving is tax deductible. Gifts can be made via credit card, PayPal or check. All questions regarding sponsorship opportunities or donations should be sent to treasurer@bamit.org. Student activists Ben Moultrie (left) and W. Ahmad Salih at a Task Force on Educational Opportunity meeting, 1971. Benjamin F. Moultrie MBA ’76 was a financial-aid administrator in the early 1970’s. Aero-astro major and Waayl Ahmad Salih '72, SM '74 was a student activist who later became a physician. for your generous support in donations and pledges.